Ceci est une version archivée de Groupegena6 à 2019-01-30 15:38:40. Nowadays, there are about 430 grey wolves in France. This is a protected species so it is forbidden by law to chase it. But the grey wolf is not only a french problem, it goes beyond borders. Many pack are present in other countries; Spain around 2500 wolf more exactly in the Iberian Peninsula, Italy between 2000-2400, Swiss with 4 packs and Germany 47 packs, each pack sizes vary, most packs have 6 or 7 members, although some may include as many 15 wolves. Can we find a place for the wolf ? Gradual colonisation of wolves in Europe. In differents countries : reactions of people and governements, appearance and presence of this large predator. Finally a point about wolf in literature and traditional view in differents european countries. Large predator : In predator group it's the last, there is at the top of food chain in an ecosystem. It's not a prey, it's just a predator. In this group we can identify in Europe the wolf, the bear, the lynx and the wolverine. Tradition : Myths, legends, histories of past that has been passed down through generations. This is a base of culture and collective psych in each countries. Cohabitation : When two people/populations live together in the same place. Support : Help for farmers to coexist with wolves. There are financial support to balance death in herd and help to protect livestock (electric fences, livestock guard dogs...). A video about a driven hunt organized by french beaters in Alpine foothills of Provence. It exposes the view of the hunter but also the farmer of the region who blames the wolf for ruining their age-old pastoral existence with incessant attacks on their herd. Driven hunt : An outdoor activity consisting in regularizing an animal population (wild boar, wolf,...), a quota is established according to the density, number and location. 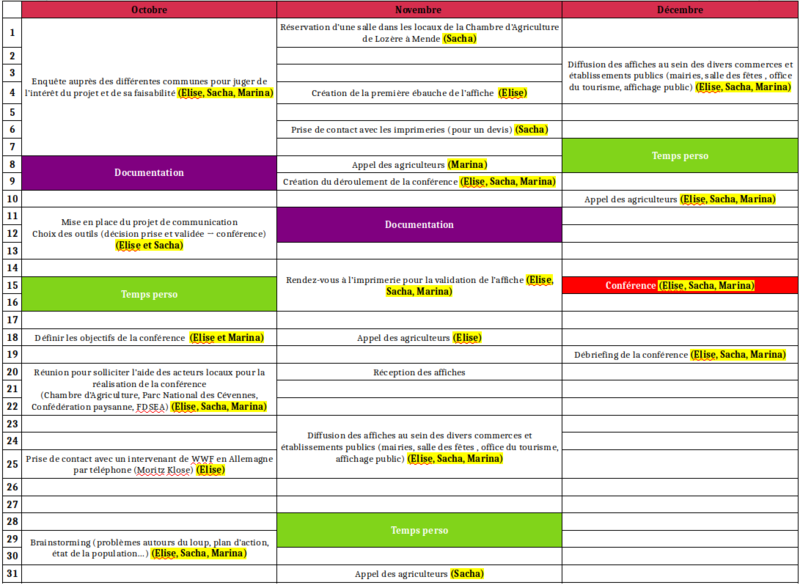 Each department in France has their regulations law, defined by the state of the targeted population. It is organised by hunters registered in a hunting association or federation. Impact of wolves after their reintroduction in National Parc of Yellowstone (USA). They reduced populations games and they have helped to change positively the ecosytem. This exemple is in USA, not in Europe, but it is interesting to have a point of view about the impact of wolves on the environment. Reintroduction : An action which consists of releasing an animal or vegetable species into the wild to ensure its presence in an environment where it has disappeared by natural causes or by human activity. It also avoids genetic drift (consangunity) or extinction. Small video on the action that shepherds led in the heart of Paris, at the foot of the eiffel tower, to protest against the increase of the attack of wolf. La conférence est à destination des professionnels (élus locaux, des éleveurs, parc national, parc des loups du Gévaudan...) mais reste ouverte à tous les habitants du territoire. - 50€ pour le "pot de bienvenue"
On a choisi de prendre une image neutre du loup pour ne pas prendre partie dans le débat. Notre but est d'éclaircir le sujet du loup dans le monde agricole et non pas influencer les prises de position : les différents avis pourront ainsi être exposer librement. Nous avons aussi intégrer les logos des différents intervenants. 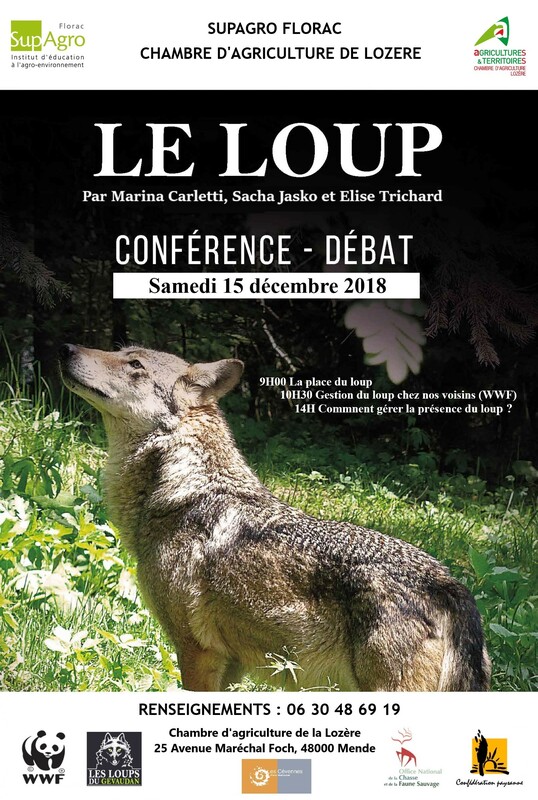 Enfin, nous avons fait le choix d'une image de loup au centre de l'affiche pour bien illustrer le sujet du débat. European Wolf Plan : project of laws proposed throughout an inter-parliementary conference "Defend pastoralism: towards a European Wolf Plan". It's for conservation, protection and management of wolves on all european territory.